I had to take a wee break on the CSA front. My wonderful Gathering Together Farm share ended last week, with my regular winter CSA (Hood River Organic) scheduled to begin right away. But upon opening my fridge (oh, and eyeing the counter top too!) , with the veggies still nearly toppling out, I knew I had to admit defeat. I needed a week to “catch up” and use these amazing and still farm fresh gems. That’s what wonderful about this fall and winter local produce…it waits very patiently for the chef! So this week is devoted to all of the lovely bits and pieces I had, ready for their spot in the dinner line-up. Thanks for HRO‘s great flexibility, I can give them a call at any time, scheduling a delivery right to my doorstep, once my fridge has just a bit more room. To me, potato leek soup always seems deceptively rich and buttery. The potatoes as thickness, allowing you to add milk, cream, or butter in very moderate proportions. This version surely will not lack in flavor! It’s a simple weeknight version, just hand-mashing the soup once the potatoes and leeks are softened. You can make it as chunky or smooth as you like. My fresh dill and some added crunchy, smokey bacon will be perfect finishing touches. Add some good bread for dunking. Or better yet, lightly toast the bread, with a sprinkling of cheese on top – Tillamook extra sharp or Beecher’s flagship cheddar would make excellent choices. I’ll admit it…I am a sucker for fritters. Whether in the form of fried potato pancakes, parsnip latkes, or kohlrabi and carrot fritters, each one is a unique way to add some fun to your meal. This recipe struck me as a wonderfully unique was to use my kohlrabi and carrots, and with a little side of pacific northwest salmon, it was a full meal deal. Preparation of the fritters is simple – just grated veggies, an egg for binding, and some salt and cayenne for seasoning. What will make these extra special is the lemony avocado cream sauce! For the salmon, don’t overthink it. Salt, pepper, and a 450 degree oven for about fifteen minutes. This bisque is fall-ish and fabulous, especially with mashed fresh pumpkin. Roasting a pumpkin is simple! With onions, potatoes (you could also use kohlrabi here), and apples, this soup is chock full of autumn bounty. The added Thai flavors of peanuts, curry, and cilantro are amazing. With an immersion blender to puree the soup right in the pan, it’s even an easy weeknight contender. Especially if you add some pre-made asian chicken skewers from your favorite market. Just broil or grill, and serve alongside this flavor-packed soup. I love the idea of using roasted squash atop pizza! 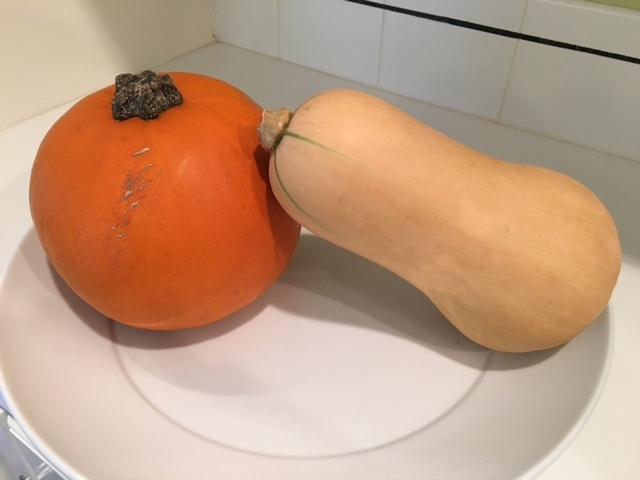 Any winter squash is delicious, just be imaginative in your shapes and sizes. Butternut, which is what I’ve got, is an easy one. The skin is so thin, you can use a vegetable peeler to remove it. Follow this previous Pizza Night post for a no-fail dough recipe I rely on each week. It makes enough for two pizzas, even three if rolled out in the super thin, best-for-crispy-pizza style. If you’re short on time & energy, pick up a couple of pre-made doughs from your local pizza joint or grocery store. Sprinkle the crust with some mozzarella and some gorgonzola (or other favorite blue), bake until crispy & golden, then decorate with slices of pre-roasted slightly spicy, slightly sweet winter squash half-moon slices. I might even caramelize an onion (sliced thin, a little oil, a little water, and low and slow until golden and soft) – some for a pizza, some for the week! I’ve got no arugula, but a sprinkling of finely chopped parsley over the final pizza would sure be pretty (and tasty!). Tonight’s dinner is inspired by a recent meal at Portland’s renowned Nostrana restaurant. I was lucky enough to enjoy this outstanding feast, celebrating Portland Farmers Market’s 25 seasons. The chefs put together a seemingly endless array of delicious dishes, each inspired by our local farms. Just when I was puzzling over what to do with the overflow of pale veggies in my fridge, here was my inspiration… a toppling platter of the most tempting taste treats, in the form of all white veggies! Nostrana’s chef unabashedly served an entire family-style platter of fennel, celery root, salsify (white dandelion root), and cauliflower. Normally this might appear quite boring and bland, but not when it’s kicked up a notched with a dish of vibrant green pesto the side. Nostrana’s choice was an orange pistachio pesto, to be drizzled over the veggies – it was indeed out of this world. Given my plethora of parsley, I’m going with a parsley pesto, which will be the perfect flavor combination atop my own veggie array. I’ll roast celeriac, kohlrabi and turnip “sticks”, as well as cauliflower florettes, until golden, drizzling with olive oil, salt, and some spicy red pepper flakes. The parsley pesto is nothing more than lots and lots of parsley, mixed with olive oil, almonds, and parmesan. A wonderfully Italian-inspired mid-week dinner, served with ciabatta and a made-by-someone-else roasted chicken. This Pastaworks farro salad often serves as a blank canvas for me, and is definitely a proven crowd-pleaser. Farro is a virtual nutritional goldmine, and offers a wonderful full-bodied texture and flavor. This week, I’ll thinly slice my sunchokes, roasting them until golden with a drizzle of olive oil and a sprinkling of sea salt. These will make a rich, nutty, chewy, fabulous addition to this tried-and-true salad. No matter what veggies you add, it holds a divine combination of earthy, sweet, tart, and spicy – adjust the harissa to your own personal spicy barometer. Have fun trying different nut, seed, and dried fruit combinations here as well. Everyone loves tacos, so I’m thinking they’re are a wonderful vehicle for my remaining half head of farm fresh cabbage. This cabbage slaw is simple; I’ll use olive oil instead of mayo, probably doubling the oil and lime juice, as I’ve got a lot of cabbage! You can also be sure I’ll forgo any massage, drain, squeeze steps here. More work, minimal difference. Some super simple tacos I go to again and again are these tasty minis, with the corn tortillas thrown on the open gas flame of my stove, to get them just a bit browned. Saute lots of garlic and onion in some olive oil, then mix in some shredded chicken from a made-by-someone else roaster. (Mine will be the leftover version…) If you’ve got fresh cilantro, toss that in as well. At the table, I let people fill their own tacos with this yummy chicken/onion/cilantro mixture, some beans-of-choice from a can, and maybe a sprinkling of cotija Mexican cheese. The zesty cabbage slaw will be a fine addition, either wrapped inside or kept separate. These tacos are really nothing like the traditional American version, stuffed to capacity, dripping with cheeses and sour cream – they are light and fresh and perfect for sampling an array of favorite salsas. Call it vegetable lust. I sit and stare at my table piled high with veggies from my CSA, tinkering and toying with the puzzle they present, until voila, out comes a meal plan for the week. Here I delight in sharing the resulting menus and ideas, where the fresh produce rules: in full flavor, in good conscience, and always in season.